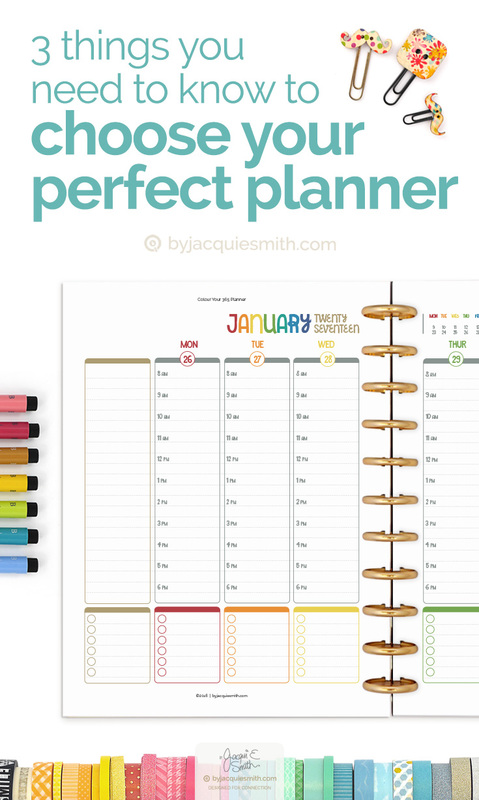 With so many gorgeous planners on the market today, how do you choose your perfect planner? No one wants to waste money or time trying a planner that just isn’t designed for you. There are a three important things you need to know to confidently choose your perfect planner, one that works with you + looks fabulous! Know these three things + you’ll be ready to choose a gorgeous planner that works with you! Over the past few years I’ve tried a lot of planner styles + read a lot of books about productivity to find out how to get more done. I’m a self confessed project starter + unfortunately wasn’t finishing as many as I began. I wanted to stop the overwhelm of too much to do, those unfinished projects really add up, + easily know what needs to happen next. From a day to a page to weekly spreads, and single lists. I’ve mixed + matched a multitude of options. I’ve tried new strategies + tweaked old ones. Some things worked, and others not so much. The most interesting thing I discovered was the more I learnt about myself, the easier it became. Knowing how I worked + why showed me to look for. I was able to choose my perfect planner, one that worked with me + looked fabulous. There is no point in choosing a planner purely based on looks. It’s not good criteria for a spouse + it’s not good for a planner. Before you choose your perfect planner take a moment to learn from yourself. When I say learn from yourself I am talking about recognising what you do that already works + knowing what your needs are. When is the best time for your idea work, writing, designing, creating? Don’t forget to take into account the specific demands you have on your time. If you work from home with tiny humans, nap time maybe your working hours. Maybe you have to be available at certain times for a particular client. Do you like doing a bunch of similar tasks together? Do you get distracted easily or have trouble knowing what you need to do next? Are you someone who loves a splash of colour when you plan or will your favourite pen do the job? Do you find yourself making lists or do you intuitively know what needs to be done? Do you need to carry around your planner everywhere or will it sit on your desk? What kind of binding would you like, wire, disc or ring? Do you want pages to be permanent fixed or removable + easily able to add more? What kinds of things do you need your planner to track? Do you need to combine work + family in the one planner? Write down all you can here. It will be helpful when your ready to choose your perfect planner. Download the free printable below to take notes. The second thing you need to know about to choose your perfect planner is yourself. There are some easy ways to discover more about you + one of those is to take a personality test. Personality tests are a fun way to get to know yourself. Many times they will confirm what you already suspect about yourself. And they can help to answer questions about why certain things work for you. These are three personality tests that have proved extremely helpful for me to understand who I am + how I work best. My results confirmed some things I already knew + helped me understand why things worked. Sally Hogshead’s “Fascinate” test is my favourite. Unlike other tests, this one shows you how the world sees you. I personally recommend paying for the full test to receive your complete report. When you find out your dormant advantage, the picture of who you are becomes so much clearer + you know exactly what drains your energy fast. The second test is called Strength’s Finder, and is accompanied by a book. I’ve only taken a free test (sorry it’s no longer available online) and found it very helpful. This one as the name suggests, confirms yours strengths. We are our most productive + fulfilled when we operate in our strengths, as opposed to spending our time “working on” our weaknesses. Another popular test is the Myer-Briggs test. There are a multitude of free Myer-Briggs style tests online for this one and plenty of written material on the 16 different types. A great podcast for working out your personality style is Mind Your Business : Episode 20. I recommend listening to this one as James Wedmore + Phoebe Mroczek talk you through building your profile. Lastly I want to mention a free Values quiz at Think to Perform that helps you narrow down your values. While this isn’t directly related to your personality style, it is interesting to see how your values align with your strengths + can be very helpful when you come to planning your goals + deciding on what opportunities to say yes to. Write down all the relevant information about yourself on the free printable below. From the tests you can discover your unique plan+do™ style, the easy way you choose your perfect planner. Knowing your unique plan+do™ style makes it easy to choose your perfect planner. There are four distinct styles, each with their own unique way of working + planner recipe. Today we’re taking a look at the different styles + next time we’ll start looking at their corresponding planner recipes. We’ll begin with the Creative planner style. These people are big picture thinkers + often find it difficult to stick to a rigid schedule. Creating innovative ideas is what fires them up. Often they will start a conversation with, “Imagine if …”. Creatives work best with large chunks of time. They get the most done when they can focus on a specific projects or kinds of tasks for longer periods of time than most would care to. They love using colour when planning + doing, and no office or craft supply is off limits. There is no better way to spend an afternoon shopping than at craft + office supply stores. As a Creative you’ll enjoy a weekly page with a plenty of space + a master todo list. Flexibility is super important as you never know when a new idea will strike or something will come up that could change your plans. Expressives thrive on connecting people. They love telling stories, talking on the phone, chatting + making sure everyone is a-ok. Blocking in smaller chunks of time works best for projects or when batching tasks. They also love to use some colour + a little crafty goodness, maybe a sticker or two and some washi tape. As an Expressive you’ll enjoy a week spread with a little structure + a master todo list. You like to see how everything works together, while being able to focus on the important things for the day. Listers, as their name suggests, love lists. They are natural wonders at planning out a project + factoring everything in + as such are awesome at managing projects. They thrive on details, lists + all things organising. Listers enjoy a little colour, a few different pens are all they need to set big things in motion. As a Lister you’ll enjoy using a day to page with a little structure to really dive into your plans + allow for that bit of flexibility you like. You’re well aware life happens in the midst of a great plan + your planner needs to allow for those unexpected happenings. These guys are incredible. Need to know details, Analysers are your people. They are efficient, fact finding ninjas. And they have a unique talent for getting an incredible amount of work done in a short period of time. Focused is their middle name. They function best with a timed schedule. Need to meet with them, just book in a time. Looking to complete a project, just name the date. A favourite pen is all they need to put their plans into action. As an Analyser you will thrive on a timed day to a page. A time for everything + everything in it’s place. # Tip : Dive in deeper + learn more about your productivity style with Carson Tate’s productivity assessment + her book Work Simply. With the foundations in place, knowing what works, who you are and your plan+do™ style, you are ready to choose your perfect planner, one that not only looks fabulous but most importantly will allow you to successfully organise your day + enjoy getting things done. I look forward to diving in deeper over the next few weeks as we discover how to use your plan+do™ style to create your perfect planner. I’ve found a great set of inners for my planner on your site, but my biggest challenge is finding the file/organizer for it. I don’t want something that is A5 or A6 sized, but am finding it impossible to find a really great A4 sized planner. Any suggestions? So glad you found them Claire. What can I help you with in setting up your planner?